SEARCH FOR LATEST NEWS ON AI? In the 18th century if you tell someone that one day we can go to the moon, can fly like birds, or can talk with people 1000 km away from us then what will be their reaction? Probably they would think that you are a madman. But now in present whole, these things are happening. Because time changes. Who knows even this phenomenon which is like impossible to us or like a Sci-fi can be available till 2050. Anyways, today you are going to read some amazing future technologies, which researchers are now either in the process or in the final stage and will be available till 2050. After reading this line you may be in shock but it's real. 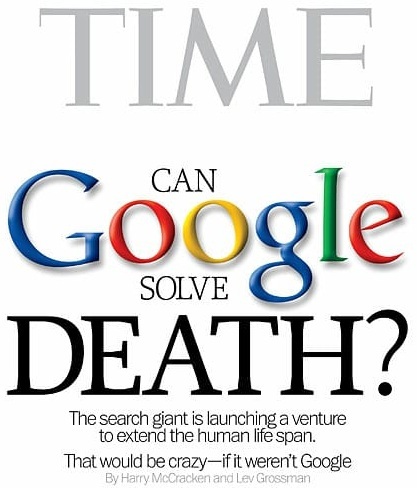 There is a project called Google Calico which mainly researching in this topic. 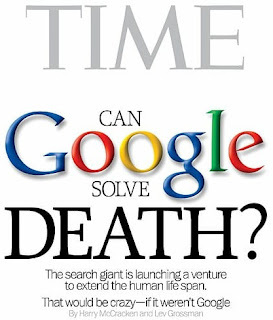 Calico is researching on why people get old and why people die. They are also focusing on the development of some technologies which will decrease your age symptoms. Actually their main focus on to reduce the age and hence ends the deaths. Gino Meditating is something that we have seen. Where? In Jurassic Park movie. Yes, that is Gino meditating, by which using a DNA of another type of species or lost species can be made again. Research are on its peak for this purpose. It is the future of DNA engineering. In this project, even a mosquito was developed where there was no meleria paraside. Strange but true. May be with the advanced development of this project in future men will be able to precestors. Now it's available in some parts of the world, but though we can say this as a future technology. Recently a video from Mark Zuckerberg came out about his smart home. Where every electronic product is connected on a networks. 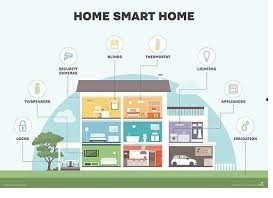 Smart homes, it is a magic of IOT and AI. Every product will be connected in a network and central AI network will monitor them. It's something like that, when you entered your home, doors will be automatically open, the light will be depending on your mood etc etc. You think, how this is a future tech? Yes, contact lenses are not future technology but the future of contact lense technology is changing. There are digital contact lenses are available now. Which have the power to detect your body glucose, body temperature etc. Google and Novartis, in its joint venture, has developed these type of lenses. And who can say, may be in future we will see lenses which can take pictures just like Mission Impossible movie. What is your phone's camera quality? 5MP, 10MP, 30MP? This is general. But there are more huge quality cameras are also available. Yes but these are not available for general people. US energy department recently introduced a LSST 3.2 giga pixel camera. It is mainly a telescopic camera with 189 sensors and 3 mirrors. Its weight is 2.7 ton and it is capable of capturing picture 40 times more greater area than the area of the moon. 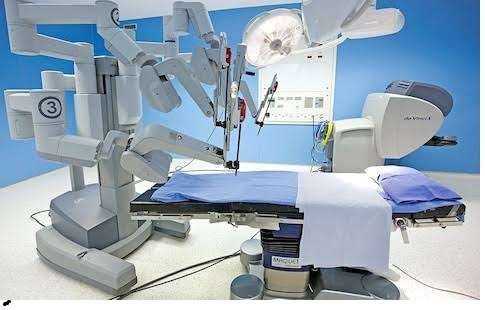 With the advanced development in AI and robotics sector, now people are thinking to use robots in operation theaters. They are arguing that men are coming with errors and with the use of machines, this error rate can be reduced. Soon we will going to see surgical robots in the market. These are some technologies that will be available in the future. The development of AI and machine learning is growing so fast that we will get many of this products very soon. Hope you have enjoyed and learned something new. Please visit Our site http://www.everythingaboutartificialintelligence.com to read such articles on AI and Machine learning. We post articles for general people. so that they can understand the latest technologies and future technologies. 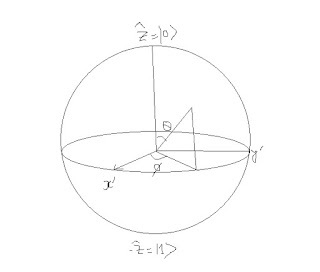 In 1950 a mathematician introduced an examination system to examine the learning process of the machine. His name was Alan Turing. Respecting his invention the method or test was named as Turing effect or Turing test. It is like an examination that we sit to pass our classes. There are some questions, that we have to answer. And depending on that answers the examiner gives us marks which state our knowledge and capabilities. The same in the case of machines to judge it's ability. How you can say a machine is artificially intelligent! Or what are the lines that after crossing this, a machine can be said to be an AI machine? It is the Turing test. Through this examination process researchers are able to understand a machine's human-like behavior. With the help of Turing test, you can find out a machine artificially intelligent or not! 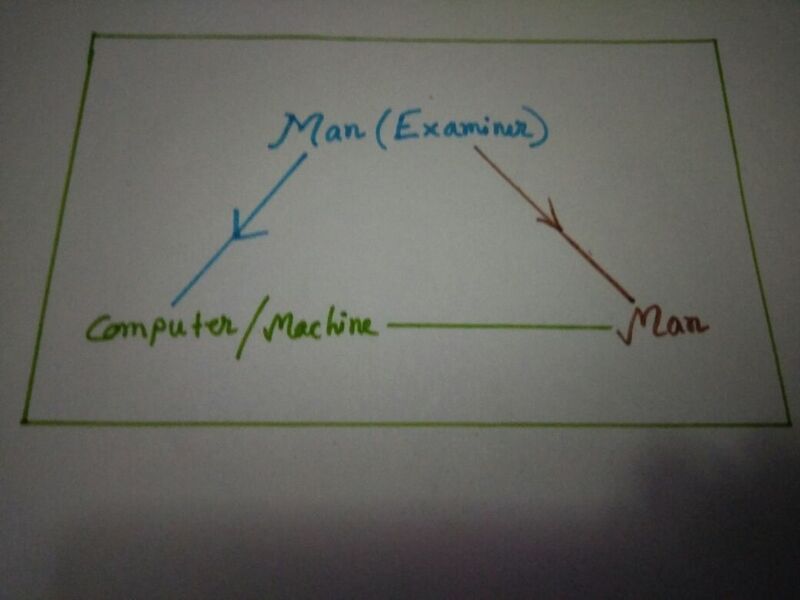 Turing test is conducted in a very simple method like it can be seen in the below image. As the above picture in the Turing test, there are 3 parts. 2 men and a computer or machine. The examiner asks questions to both the computer and the man. This process goes on and wherever in the middle of the examination. 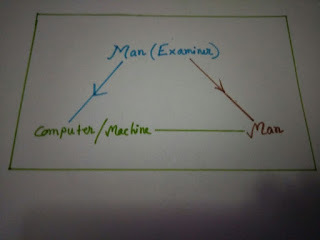 If the computer or the machine is able to make fool the examiner and if the examiner misses just the machine with the man, then the machine or computer can be defined as artificially intelligent. This is what a Turing test in a simple manner. 1. Reverse Turing test and captcha. 2. Subject matter expert Turing test. 5. Minimum intelligent signal test. Turing tests are conducted to determine a machine's capability and knowledge. But there is not a full path to examine its intelligence. As we know there is a huge difference between knowledge and intelligence. What do we think when the word AI come for non-programmers or technology related people? A picture of some sci-fi movie come out whenever we hear about AI. For some people, AI means only Alexa, Siri or Tesla's automated cars. Yes, you are not wrong. These all are coming with AI and ML features. But there are a lot more you will astonish when you know that AI can predict some diplomatic situation or advice you on your legal site like how to anticipatory bell etc. These all can be happened now, with the help of AI. Yesterday I read an article, where there was written that the jobs of lawyers in danger situation in the US. Because "Watson" is now capable of giving advice like your attorney. In the next ten years, it will be more developed. 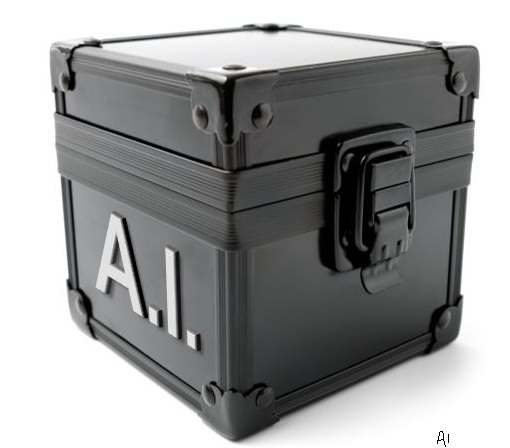 What is AI Black box? Now coming to our topic. As I have mentioned in the upper paragraph. Some very complex issues now can be solved by AI. 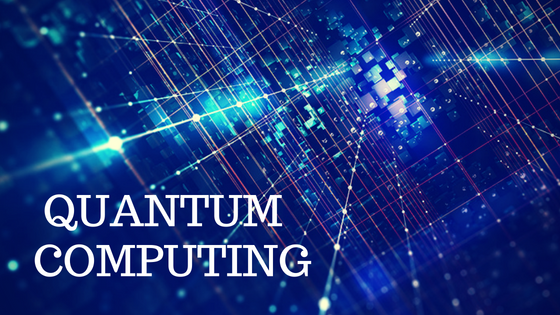 (Increasing development in QUANTUM COMPUTING will help in more development in AI). Sometimes these types of complex issues are done with the help of AI but the operator doesn't know the process. Yes, with the help of its algorithms and self-learning process, some machines solve problems & it's not possible for the operator to know the process. Because such type of algorithm and calculations can never be solved by any men. Or simply we can say AI Black box means that we can understand what goes in and what comes out, but it's not possible to know, what the machine is thinking while processing. For example, if you put a potato in a machine, chips come out and you don't know what is going inside the machine. Then the machine is called the black box. 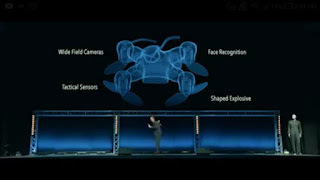 And if this case is happening in the AI field (for AI machine) then it is called AI black box. There is no such black box outside the AI field. Because only an AI compatible machine can think. This is the main concept of AI Black box. But we all know about people's thinking. People can't see what is going under the roof, so they start rumoring like this AI black box always carries out some fear because people can't elaborate on what is going on inside. So, even some government agencies always have an eye on it. But as always I say, there are two sides of a coin and never misunderstand anything by just seeing one side of it. As we all now know what is Artificial Intelligence. The intelligence that is similar to human intelligence can be called AI. (for the difference between human and artificial intelligence, click here). Experts say that AI is for human replacement and it also seems like true. Driverless cars just prove it that in future many jobs will not be available. Some say full development of AI can be harmful to humans. I don't say that it will happen surely. But in the case of augmented intelligence, it is different. Augmented intelligence is also like artificial intelligence. But it is an alternative concept. 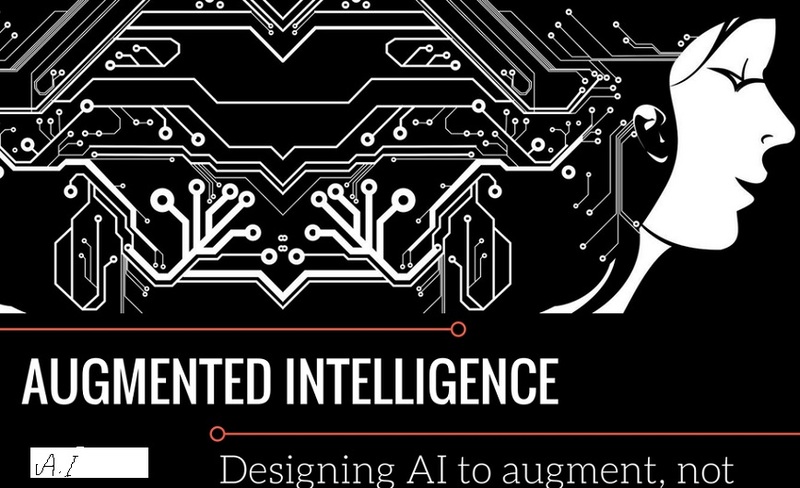 Augmented intelligence is developed to help in human activities rather than replace them. technology with the help of machine learning and deep learning. 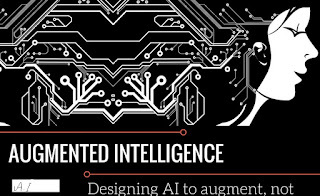 The idea of augmented intelligence was first proposed by Cybernetics and early computer pioneer in 1950s and 60. 1. In Healthcare: an augmented intelligence algorithm can analyze patients health, vital signs, compare it with histories and knowledge and help the doctor to diagnose it. 2. In Education: An augmented algorithm can monitor the student's consciousness, examine them and help the teachers to find out solutions for teaching methods. Augmented Intelligence and Artificial Intelligence are not so much different from each other in its technology, but coming into perspective it's much different. Artificial intelligence is a very new way of thought. But Augmented intelligence will always help people instead of replacing them, people will not lose jobs or at least we have to worry much more about the future. Truly sustainable development will be happened and will help people always in its manner. Quantum computing is a highly professional sector. Instead of using binary digits, this type of computers uses quantum bits. 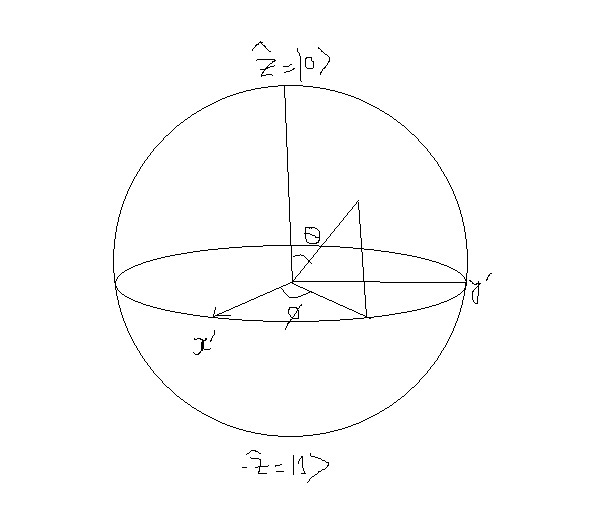 Which can be in the superposition of states. The field of quantum computing was initiated by the work of Paul Benioff and Yuri Manin in 1980, Richard Feynman in 1982 and David Deutsch in 1985. The fundamental building block of Quantum computers. Still, in 2018, you can't find an actual quantum computer. It is still in its infancy. But both practical and theoretical research continues and government and corporates are investing in it. Now coming to our title topic, that how can it revolutionize AI. Before coming to this we should know what is the difference between human and humanoid. I think mainly consciousness. It is intelligent like us, it can solve problems, it can learn from its mistakes. But can it live anybody? Can it admire a president, can it know what is bad or good in day to day life, can it decide whom to vote? We can decide because we have a brain. The human brain is the most complex computer in the world. Even scientists can't properly give the answer how much decision our brain can take in per second. Quantum computing can take the journey of AI a little bit closer to human brains. Theories show that quantum computers are able to take many decisions in millisecond like our brain. computer, it can access and check all items of data in the database, much like our own brain. This type of computing helps to integrate data from different datasets which is also very valuable for strong AI development. Quantum computer will allow for quick analysis and integration of enormous data sets. Which will improve the ML and AI capability? Till date, quantum computing is not getting its final stage. But before completing, the results that come out are strange. And we think we are going to see improved and strong AI before it completes its fill stage. In 1994, Michael Mauldin used the term "Chatbot" first. Simply it's just a computer program that can talk to humans. It is a virtual user that simulate a conversation with a human via auditory and textual methods. It was a very big problem for companies to answer a large number of queries from customers. Now the questions can be replied instantly by the chatbots. Chatbots can be classified into categories such as customer support design, Education, analytics, communication, conventional e-commerce., games, shopping, social, news marketing etc. AI, Machine learning is the very important part of chatbots. Though the terms AI and chatbot are new for maximum people, you must know that chatbots are not the latest invention. The first chatbot ELIZA was created in 1966 by Joseph Weizenbaum at the MIT Artificial Intelligence Laboratory. ELIZA is the first chatbot that is capable of attempting the Turing test. After ELIZA there are many chatbots were made like PARRY, Jabberwacky, ALICE. ELIZA and PARRY were used to simulate typer conversation. In this post, we are going to discuss the chatbots, which were shut down. In one of our previous post, we discussed the chatbot of facebook which was shut down. Now we are going to discuss on Tay and Zo. This chatbot was originally released by Microsoft via Twitter on March 23, 2016. It was designed to mimic the language patterns of a 10-year-old American girl and to learn from interacting with users of Twitter. At first, it started to reply to other Twitter users and was also able to caption photos provided to it into a form of internet memes. But some users on Twitter began tweeting politically incorrect phrases, teaching it inflammatory messages, revolving common themes such as "GamersGate", "Cuckservatism" redpilling. Due to which it began releasing racist and sexually-charged messages. AI researcher Roman Yampolskiy say that Microsoft had not given the bot an understanding of inappropriate behavior. That's why it learned such behaviors. Tay twitted more than 96000 times in 16 hours before Microsoft suspended the Tay's twitter account. It is not possible for them to delete all the offensive messages. On March 23, Microsoft released an apology on its official blog for the controversial tweets by Tay. But on March 30, 2016, they again released Tay on Twitter accidentally while they test it. Tay again released some drug-related tweets. But it was taken offline quickly. Zo: It is the successor of the chatbot Tay. Zo was first launched in December 2016 on the Kik messenger app. But it was also shut down due to some offensive tweets. When developing Artificial Intelligence, everyone wanted the machine to act and behave like a human. But is it good for them? I mean humans not only good behavior, there are many bad things that a machine can learn from us. The two chatbots are just an example of it. We are not opposing AI and Machine Learning. But if a human can kill another human, then why a machine will not? If a human can waging war for land and existence, then why the machine will not, While they learning from us. The question is is it important for the machines to learn from a human? And if it is, then can it will be possible to build an AI machine only with good behavior? Don't astonish after seeing the title. Today here you are going to read about a killer drone. Yes, a killer drone. This drone is capable of identifying suspects of bad people and able to kill them on its own. AI and Machine learning is the main thing in Robotics. In this article, we are going to take one example of the negative uses of AI. This article is about the negative side of AI. People always should know both the good and bad sides of anything. In 2017 a video came out on YouTube which shocks the world. This 7 min video showed something very astonishing. This video showed a little drone. With the help of AI, face recognition system, it can kill people. Even a people of a city by explosives like a massacre. It's just to believe. 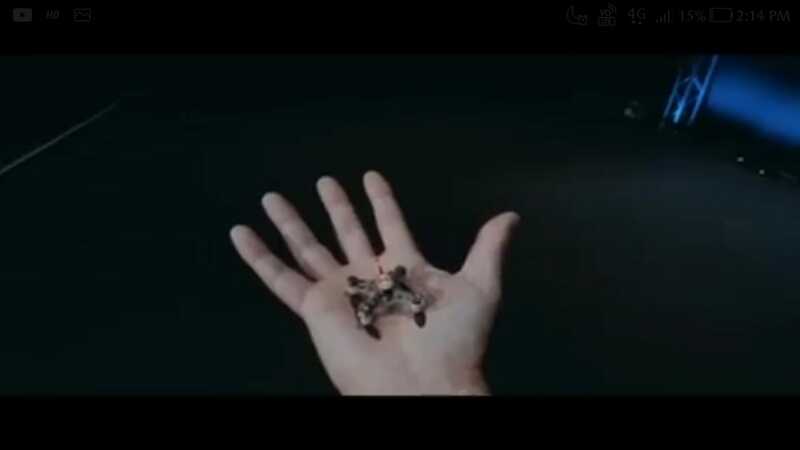 This is a small drone with AI facilities, very small in size fast, accurate and unstoppable. The launcher of the video called it "Autonomous Anti-Personal System" (APS), which employ an array of cutting-edge AI technology. This is capable of avoiding obstacles in motion. This is trained with the moves & flying insects. It has face recognition system. It can also recognize its target by its gender, uniform, and ethnicity. It also carries a mini weapon which directly able to shoot in the head. As I mentioned before a coin has two sides. It always depends on users. A gun can be used in both offensive and defensive manner. This drone is good. It reduces human risk in the case of military uses. But what if ISIS, Boko Haram get it. It always depends on uses, how we use anything. Rest is in the readers view. Comment below what you think about it.